The most complete manual of its kind, this handy book gives you all the formulas and calculations you are likely to need in drilling operations. New updated material includes conversion tables into metric. 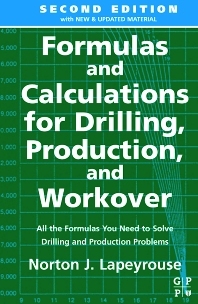 Separate chapters deal with calculations for drilling fluids, pressure control, and engineering. Example calculations are provided throughout. Presented in easy-to-use, step-by-step order, Formulas and Calculations is a quick reference for day-to-day work out on the rig. It also serves as a handy study guide for drilling and well control certification courses. Virtually all the mathematics required out on the drilling rig is here in one convenient source, including formulas for pressure gradient, specific gravity, pump output, annular velocity, buoyancy factor, volume and stroke, slug weight, drill string design, cementing, depth of washout, bulk density of cuttings, and stuck pipe.